Today is the last day of this great sale. There are products on sale for up to 40% off. Also today, there is a 24 hour sale going on for select products. See the list here: online-extravagana-product-list-us-1-1. One of my favorite items on sale today is the BIG SHOT MAGNETIC PLATFORM. It is marked down 35%! That brings the price to only $26.00 from the original price of $40.00. If you do die cutting and don’t have this great product, you won’t want to miss this deal. It holds your dies in place and makes cutting out items easy by letting you line up the item without using some kind of tape. Some of the other items on sale today are the Flurry of Wishes stamp set and matching punch bundle for 20% off and the Bell punch for 40% off. That makes the price on this punch only $10.80 and can be used all year round for Wedding Cards as well as Christmas. There are other items that have been on sale this week for 10, 20, 30, and 40%. See the list again here online-extravagana-product-list-us-1-1. Some of these highlights are the Heart Confetti Border Punch at 30% off, which is great for Valentine’s day, the Sprinkles punch which is great for Birthday’s all year round. It is also 30% off. There are several more wonderful dies on sale for both Christmas and all year round. You can also try Paper Pumpkin or pick up a favorite kit and some are on special WITHOUT being a subscriber. Also at 40% off is the Stitched with cheer project kit where you can make 18 Christmas cards for only $14.40. The kit comes with everything you need except adhesive and scissors and the matching stamp set (but you can use another stamp set you might have). You can order on-line at http://darleneseitz.stampinup.net, where you can also see a picture of the items OR contact me via a comment below or by email: darstz@hotmail.com and I can place the order for you. Stampin Up has put their new Stitched Framelits out for sale now instead of waiting for next years catalog. Ovals, squares and circles come with the set (4 of each for a total of 12). All the framelits come with a stitched look around them, adding the perfect detailing to your project. In addition, they are offering several stamp sets that go perfectly with the framelits for 25% off. Some from the Holiday catalog and some from the Annual catalog. Above is the flyer showing the sets that are on sale. The 25% off sale runs through the end of the month. In addition to the above great deal, Stampin’ Up is running an online extravaganza for black friday starting on Monday the 21th through the 28th. Some products are only discounted on the 21th and the 28th for 24 hours. Other products run for the entire week and are either 10, 20, 30 or 40% off! Please see online-extravagana-product-list-us-1-1 for details. Here is a picture of some of the deals for Monday, November 21th. Let me recap some of the deals I think are great: The Big Shot Magnetic Platform will be 35% off on November 28th for 24 hours. The regular price is $40.00 and on that sale day will be $26.00. That’s a great deal for this must have. The Holly Berry punch, regularly $18.00 will be marked down all week to $10.80. The Stitched with Cheer project kit is also marked down all week from $24.00 to $14.40. This is really a great deal as you can make 18 cards for the holidays. You do need some additional supplies like ink, stamps and adhesive, but if you are local, I can provide them if we can get together to assemble the kit together. Stampin’ Up’s holiday card kits have been awesome in the past and this one is no exception. If you have ever wanted to try Paper Pumpkin, now is the time as there are a couple of kits (and some refills) being offered at 30% off. If you become a paper pumpkin subscriber I also provide additional materials to make some extra goodies with the kits. The Heart confetti border punch is also available all week for 30% off which is a must for Valentines’ projects. Next week’s sale items will be available in my on-line store (with pictures) starting Monday, November 21th. 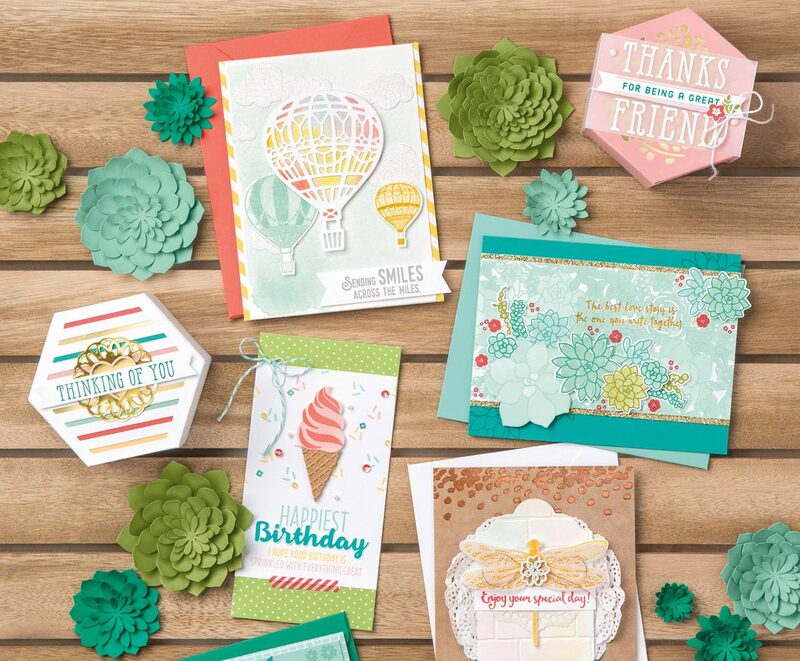 Here is the link to my on-line store http://darleneseitz.stampinup.net . If you have any questions or would like me to place the order for you, please contact me at darstz@hotmail.com or leave a comment on this blog.